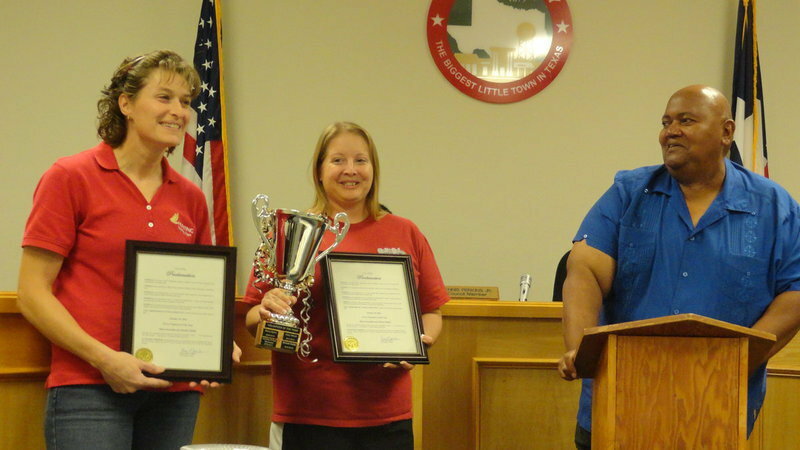 Mayor Frank Jackson and the Italy City Council named Misty Escamilla and Michele Riddle co-recipients of the Volunteers of the Year Award for the Italy Youth Athletic Association. The presentation was made at the council’s annual IYAA proclamation reception Monday evening in council chambers. Jackson made the announcement and presented both with a plaque and trophy cup to share. After the coin toss, Riddle carried the trophy home for the first six month. Escamilla will have the trophy the last six months. Both say they actively work with the IYAA working primarily in the concession stand through the various athletic programs. They both worked to set up the new concession stand at Upchurch Field. Escamilla said they basically do anything that needs to be done. Riddle serves on the IYAA Parent Board. 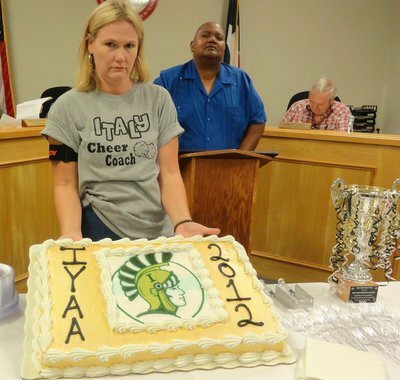 City staff served cake, cookies and punch at the reception held prior to the city council meeting.